Skin cancer includes basal cell skin cancer, squamous cell skin cancers and other rare types. They tend to develop most often on skin that's exposed to the sun. There is a high rate of cure for these cancers. Melanoma is a type of skin cancer that develops from skin cells called melanocytes and will be discussed in the next section. 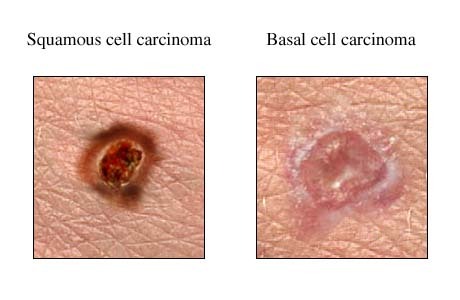 Basal cell carcinomas (BCC) develop in the basal layer of the skin and is the most common type of skin cancer. Squamous cell carcinoma (SCC) develop from keratinocytes in the epidermis layer of the skin. Skin cancers can grow slowly and it can take some years for the cancer is noticed but sometimes they can grow very quickly and appear within a few months. Around 131,000 cases of non-melanoma skin cancers are diagnosed in the UK each year. This number could be higher as they are under reported. This makes them the most common type of cancers by far. The main treatment for skin cancer is surgery and is usually the only treatment the person will need. The surgery is usually minor and the type of surgery depends on where the cancer is and how big it is. Radiotherapy can be used if the cancer covers a wide area, it is a difficult area to operate on and if surgery is not suitable for the patient. It is used to reduce the risk of cancer coming back after surgery or if the cancer has spread to the lymph nodes. Imiquimoid cream, a type of immunotherapy, can be used if the BCC is in the top layer of skin or actinic keratosis. Photodynamic therapy (PDT) uses a drug to make the skin sensitive to light. Once the drug is taken the doctor focuses a special type of light on the area where the cancer is and this destroys the cancer cells. PDT is a treatment for BCC, Bowen's disease and actinic keratosis. Chemotherapy cream can be used for actinic keratosis, skin cancers that are only on the top layer or the skin and Bowen's disease. There are no UK statistics for survival of people with non-melanoma skin cancer but the outlook is generally very good. Doctors can almost always cure BCC and it is extremely rare for it to spread to another area of the body so people almost never die from this type of cancer. In a small number of people the cancer can come back in the skin and they need further treatment. For SCC, doctors can cure most people and for the small number of people who have SCC cancer that has spread to lymph nodes or to other parts of the body can still be cured. Melanoma starts in cells in the skin called melanocytes and these are found between the dermis and epidermis. 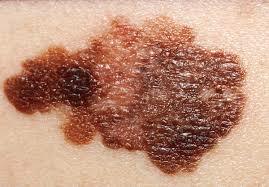 Melanoma is the most serious form of skin cancer and the most common cancer in young adults. Around 13,000 new cases are diagnosed every year in the UK and around 3,000 patients will die from this disease. Melanoma is a public health problem, with incidence increasing faster than for any other type of cancer. Melanoma is resistant to conventional treatment with cytotoxic chemotherapy and radiotherapy. In the last few years, research partnerships involving scientists, clinicians, patients and pharmaceutical companies have led to identification of new, effective drug treatments and genetic biomarkers predicting those likely to benefit from specific treatments. The Cambridge melanoma specialists provide a regional and supra-regional research-based specialist service, offering patients entry into local, national and international trials and research studies, enabling access to state-of-the-art treatments and technologies designed to improve outcomes. This is a local collaboration involving the CRUK Cambridge Centre, CRUK Cambridge Institute and the Wellcome Sanger Institute, investigating response and resistance to molecular-targeted melanoma therapies using next generation sequencing of tissue, blood and urine samples and metagenomic profiling of gut microbiota of stool samples from patients prior to and on relapse from drug treatment.